As if this wasn't complicating her life enough, Jane also has to decide whether or not she wants to begin a relationship with FBI Special Agent Alex Timmons or local crime lord Lucien Lyons. Both men are determined to get to the bottom of the crime she's investigating but may be distracted by their own agendas—as well as their love for Jane. Jane Doe is back in a bucking good story! If you enjoyed I Was A Teenage Weredeer, this sequel will not disappoint. 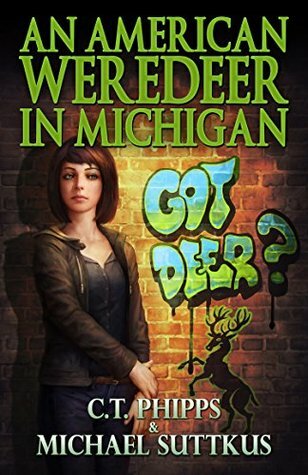 An American Weredeer in Michigan starts with a murder to solve—several actually. A mass grave of infants has been found in the forest, and whoever is sacrificing these children has been getting away with it for a long time. Jane is not about to walk away from such a heinous crime without finding the one responsible. Her best friend Emma also joins her to help and Jane's FBI-agent love interest, Alex, shows up to work the case as well. This story picks up a few months after the first book. The aftermath of the last case is settling down and the town of Bright Falls seems to have found some balance. Jane has been spending a lot more time learning to use her natural powers and she's now the official shaman of Bright Falls. Her new powers have not diminished her power of sarcasm, and she's able to keep her cool through emotional and spiritual crises. To complicate things more, a traveling group of religious fanatics is in town, and one of their local members, Robyn, turns to Jane for help finding her biological parents, who abandoned Robyn when she was young. People are turning to Jane more often for spiritual answers, her being the town shaman and all, but she's not quite comfortable with that part of the role. Jane is still trying to figure out her own beliefs in the midst of all this new "enlightenment" and she's not sure how to assure others yet. The further she gets into this case, the more she learns that supernatural problems rarely have clear-cut answers. This book has fewer deer puns, which I missed, but more deer cussing, which I was easily a fan of. The characters felt much more complex in this book, which explored more of their pasts and their relationships to each other. There is a strong sense of evolution in Jane's character by the end of the story, too, where she finds more confidence and resolve in her life and what she wants to do with her future. This is a fun urban fantasy with a complicated twist of events that's entertaining and unpredictable. It touches on some heartfelt issues and navigates tragedies with heroic ease. I'm certainly looking forward to the next one! What the buck! This is a great review! Thank you very much.